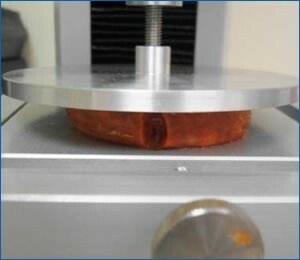 A large food processor needed a way to determine the slicing properties of its unprocessed pepperoni ingredient before the product was actually sliced. The processor was encountering problems with product that was too soft and therefore would clog the slicer in the production process. This would cause significant downtime and ultimately decreased profits. The refrigerated samples were allowed to equilibrate to room temperature (~73° F) before testing. Once the products reached a stable temperature, samples were prepared by cutting 3/8 inch, cylindrical slices from the whole product. The TMSâ€Pro system was used with a 2500 Newton load cell with a 100mm diameter compression platen mounted to it. The samples were compressed to a height of 15 mm at a speed of 400 mm/min. 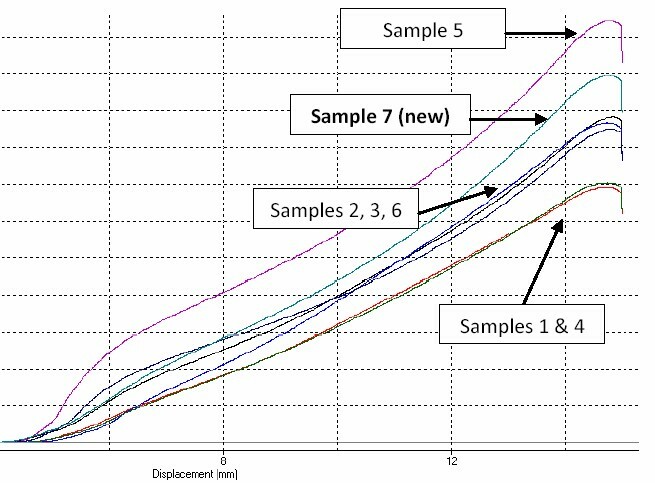 Calculations were performed to measure the peak force encountered for each test replication.